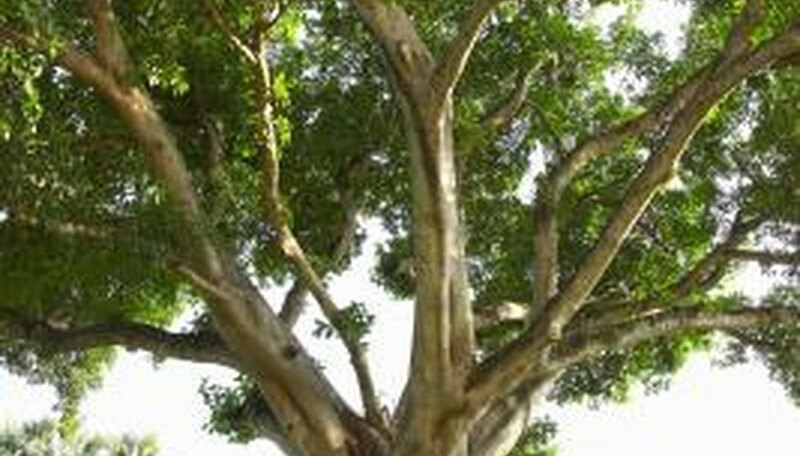 With its tear-shaped leaves and grayish bark, the golden gate ficus (Ficus microcarpa) is a beautiful tree for the art of bonsai. Basic care of the golden gate ficus bonsai is relatively easy if you are diligent. Pruning and training, which are also crucial to bonsai health, may take practice. Place 1 part sand, 1 part peat moss and 1 part screened loam in a shallow bonsai container. Place the golden gate ficus bonsai in the container, and surround it with soil. Place the golden gate ficus bonsai in a draft-free window with southern exposure. Place it under a grow light for 10 to 12 hours per day if you do not have a sunny spot. Move your bonsai outdoors when the weather warms and no danger of frost exists. Touch the soil's surface with your palm to determine whether it needs water. Water the bonsai if the soil is dry, but not if it is moist. Wet the soil thoroughly using a watering can or sprayer until water falls from the pot's drainage holes. Avoid wetting foliage as excess water on leaves can lead to disease. Apply a soluble fertilizer with a 20-20-20 NPK ratio that contains minor elements such as iron, zinc and manganese. Dilute the fertilizer at a rate of 2 teaspoons per gallon and water the bonsai thoroughly. Repeat applications every one to two weeks until mid-summer, then fertilize once every three weeks until October. Stop fertilizing in November, and do not resume until spring. Repot your golden gate ficus bonsai every two to three years in spring. Remove the bonsai from its container, and trim approximately 1 inch from the rootball with gardening shears. Remove any roots that are thicker than a pencil to refresh the root system. Return the bonsai to its container. Determine the desired shape for your golden gate bonsai. Choose the broom shape for a tree with a straight trunk and many thin branches jutting upward to form a dome. Choose a windswept shape with a trunk and branches that all point in the same direction to give the illusion of a tree on a windy day. Choose a weeping shape for an upright trunk with some branches that project upward and others hanging from the main trunk or side branches. Prune your golden gate ficus bonsai before you shape it, in early spring. Cut out any large branches that will not be suited to the shape you have chosen with bonsai cutters. Cut in a concave fashion so the tree can quickly heal. To train your ficus bonsai and create a unique and natural shape, you can use wire. Wrap copper or aluminum bonsai wire in a spiral around the branches or trunk while bending it in the direction or shape you desire. Leave the wire in place for one growing season, then remove it to avoid scarring. Your golden gate ficus bonsai branches will be in the shape you desire. Cut out or shorten small branches with your bonsai cutter as necessary to clarify the shape. Cut off leaves as necessary to enhance the look of the golden gate ficus bonsai. If you use your gardening shears on other plants or trees, clean them with a disinfectant such as isopropyl alcohol before bonsai use. This will help prevent the spread of bacteria and disease.